This presentation will help you make the most of your ReadiStep results—helping you learn more about your strengths and areas you can improve. 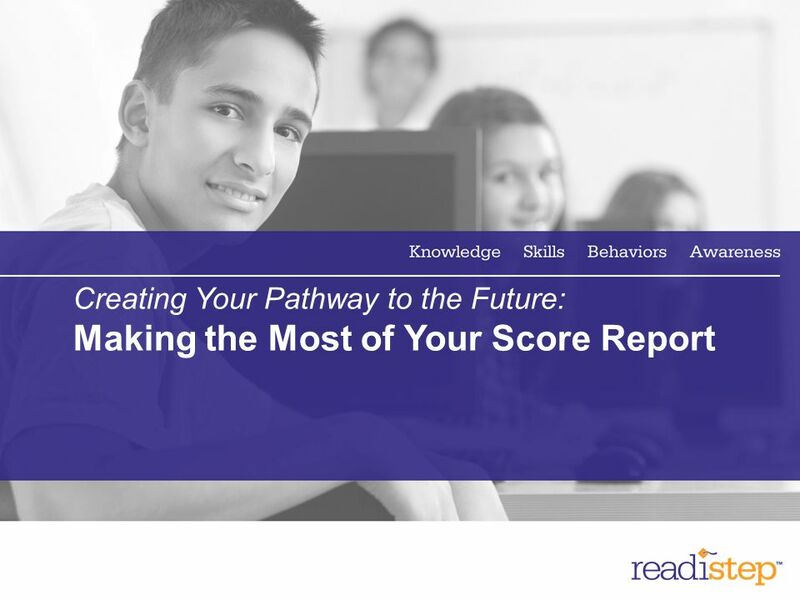 You will discover what your scores mean, what’s next, ways to improve your skills, intriguing insights into your personality and talents—as well as ways to prepare for college in high school. 3 Congratulations. 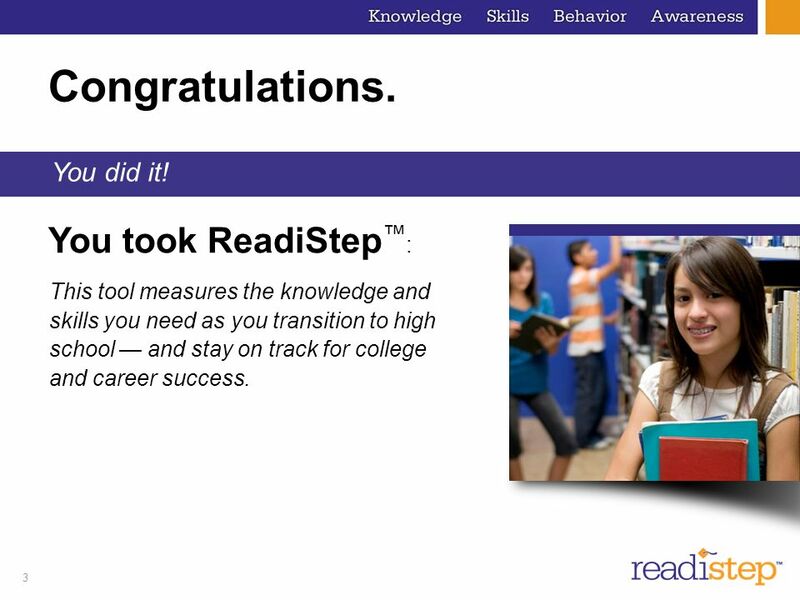 You took ReadiStep™: You did it! This tool measures the knowledge and skills you need as you transition to high school — and stay on track for college and career success. Congratulations! You have taken ReadiStep—the tool that measures the knowledge and skills you need as you take the next steps in your academic career. By taking ReadiStep, you have also taken the first step on an exciting path to high school, college and a fulfilling career. Now what? ReadiStep is designed to help you grow as a student and person. Your scores provide vital information that will help you improve, so let’s take a look at what it all means to you and your future. 4 Agenda How can ReadiStep™ help you succeed? What’s next? 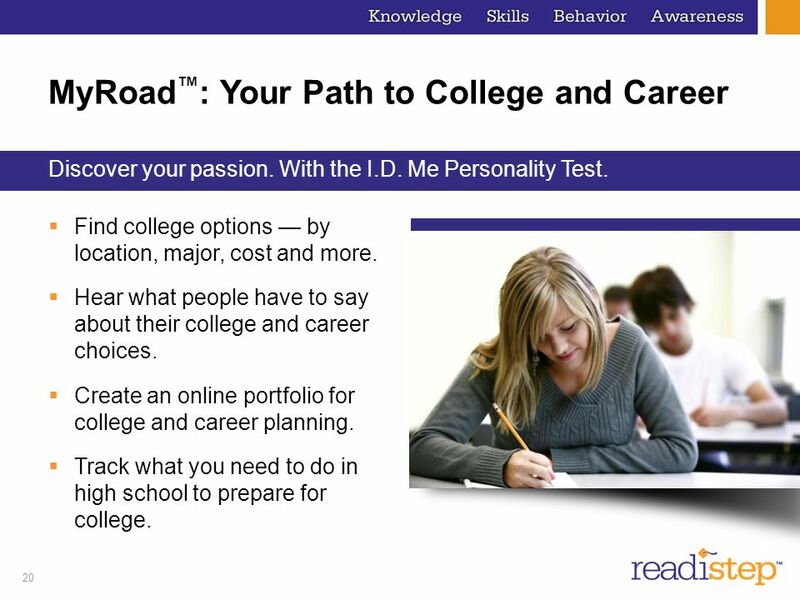 Making the most of your score report Your skill improvement plan MyRoad™: Exploring college and career opportunities We will cover what you can expect to happen next and the free tools that are available to you online to help you hone your academic skills, understand your unique personality, and help you begin the process of exploring college and career options. 5 Creating Your Pathway to the Future: How Can ReadiStep™ Help You Succeed? 6 Why Is ReadiStep™ Important? It’s the first step on your path to college and career readiness. The College Board’s College and Career Readiness Pathway is a series of integrated assessments that help measure your college and career readiness from now through the 12th grade. 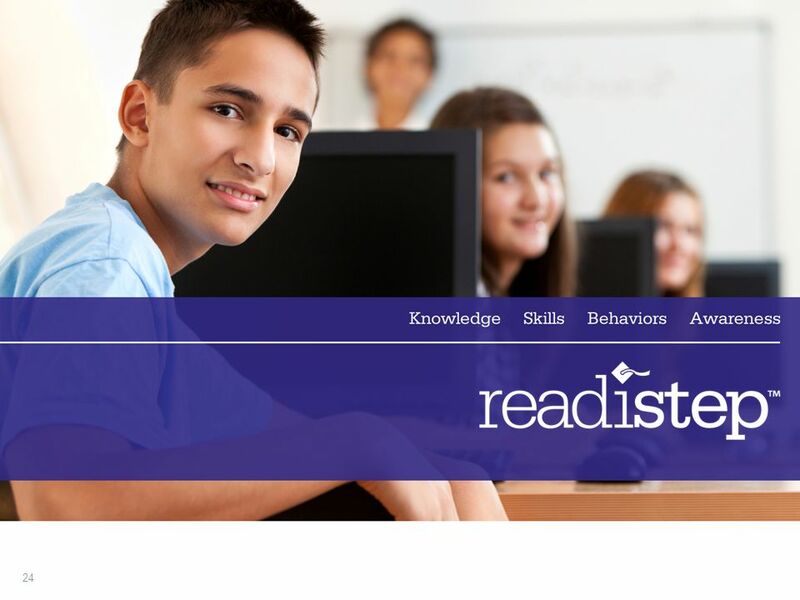 ReadiStep works with PSAT/NMSQT and SAT to provide valuable ongoing feedback on skill mastery throughout the middle grades and into high school. Later in high school, you will take the PSAT and then, the SAT, which is used for admission to college. 7 How Can ReadiStep™ Help You? 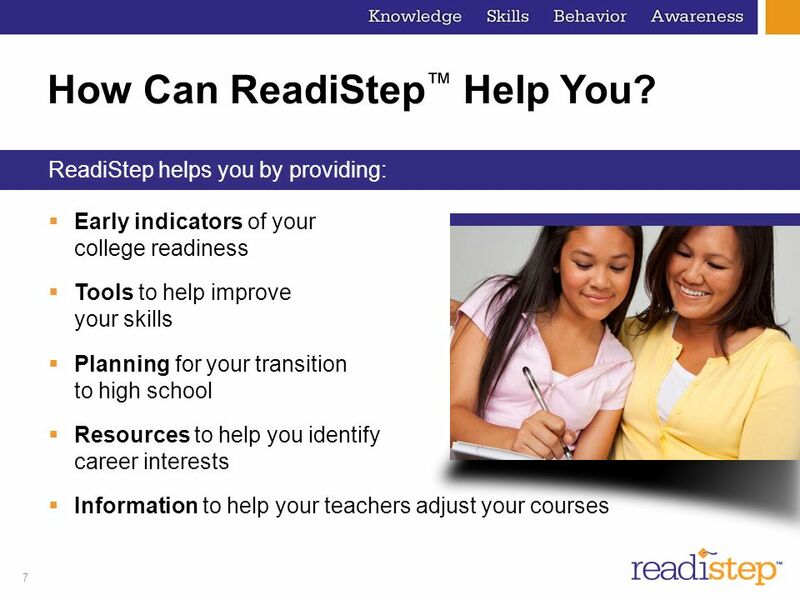 ReadiStep helps you by providing: Early indicators of your college readiness Tools to help improve your skills Planning for your transition to high school Resources to help you identify career interests Information to help your teachers adjust your courses ReadiStep helps give you a jumpstart toward college and a successful career. It’s all about you—tools to help improve your skills, support for your transition to high school, resources to help you identify career interests, and information to help your teachers adjust your courses. 8 Creating Your Pathway to the Future: What’s Next? 9 Scores sent to your school in December. Review Your Results Scores sent to your school in December. 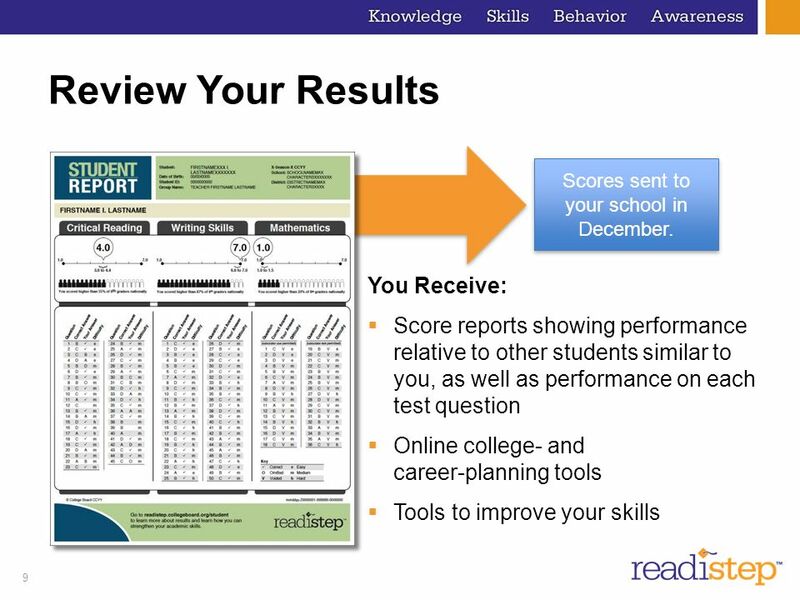 You Receive: Score reports showing performance relative to other students similar to you, as well as performance on each test question Online college- and career-planning tools Tools to improve your skills Score reports are sent to your school in December. They can help you start thinking about college and the future. In addition, ReadiStep results can also help you determine if you are ready for more rigorous course work and academic challenge. Each score – Critical Reading, Mathematics and Writing Skills is based on a scale of 1 to 7. Percentile The percentile compares your performance to that of students nationwide. Your score report will include a score of 1 to 7 (one to seven) for each section of the test. It will also show you how you scored compared to students across the country. 11 Your Answers Answers This section shows you how you performed on each test question. You can ask your teacher for a copy of the test book so you can review the questions you answered incorrectly or omitted. Finally, it will tell you the correct answer, your answer and whether it was right or not, and the level of difficulty for each question. You can ask your teacher for a copy of the test book so you can review the questions you answered incorrectly or omitted. However, you cannot keep your test book, so your school will take it back after you are done reviewing. Understanding what your scores really mean to you now—and down the road. 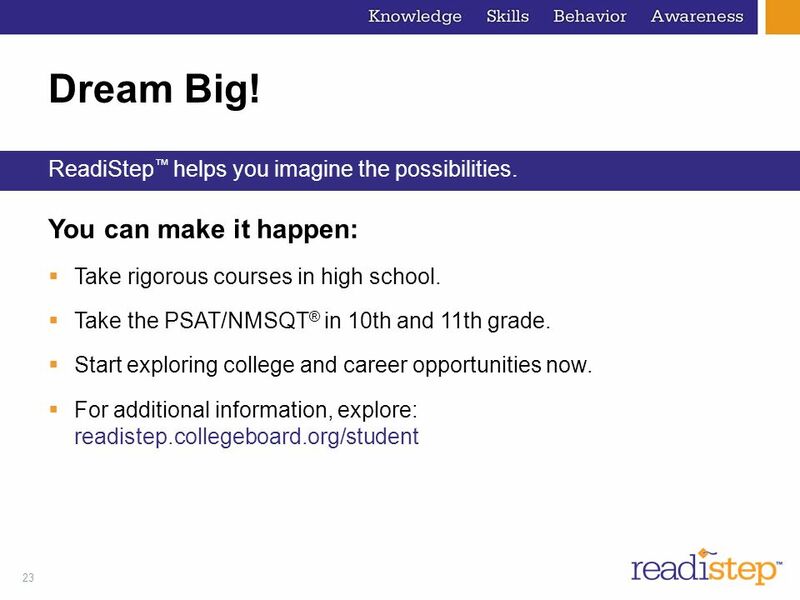 ReadiStep™ scores directly link to PSAT/NMSQT® and SAT® scores. 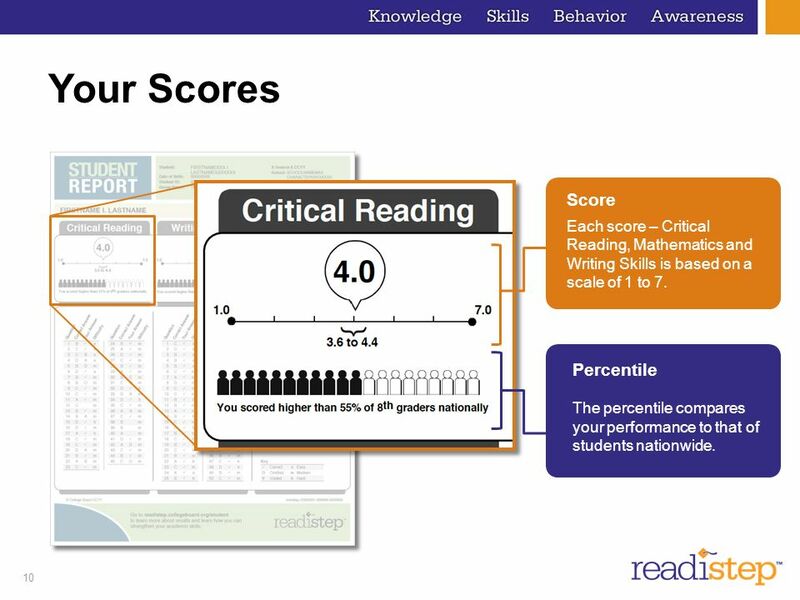 ReadiStep scores are similar to scores on the PSAT/NMSQT and SAT, tests you’ll take later in high school. For example, a score of 3.4 is similar to a score of 34 on PSAT/NMSQT or a score of 340 on SAT. 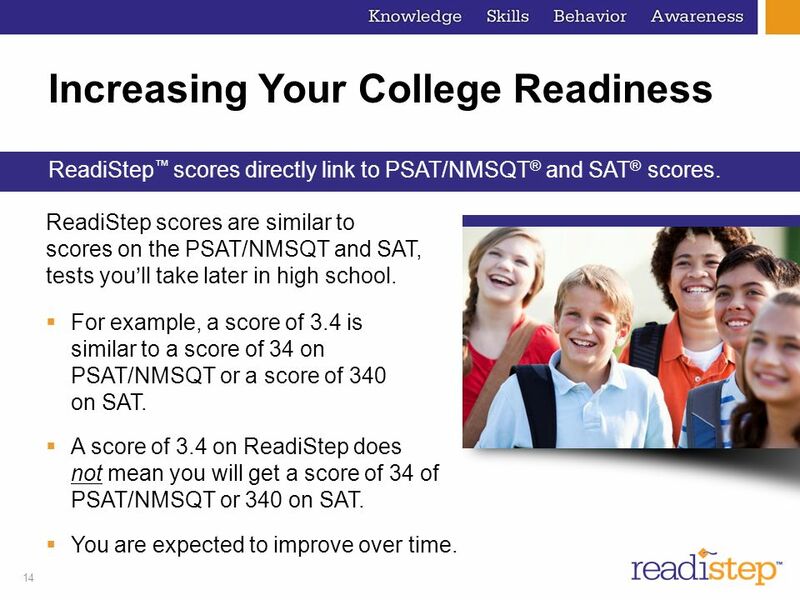 A score of 3.4 on ReadiStep does not mean you will get a score of 34 of PSAT/NMSQT or 340 on SAT. You are expected to improve over time. 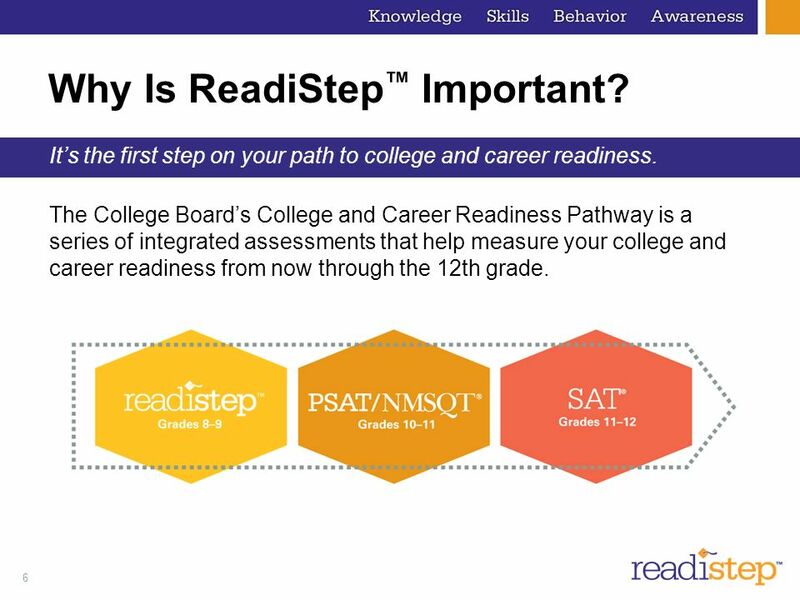 ReadiStep is the first step on your path to college, and your ReadiStep score is simply an indicator of your current skill levels. This is your baseline. You have the power to improve your skills. Over the next few years, you will learn and grow significantly -- and your scores are likely to increase as you expand your knowledge. To improve faster, work hard in school and make a targeted improvement plan – with the help of your teachers and parents. 16 Enhancing Your Skills Complete your skill improvement plan. Use your Skills Insight™ tool to assess your skill levels and discover suggestions for improvement. Always work on improving your skills: Read often. Take rigorous courses. Improving your skills is an ongoing process and a commitment. The Skills Insight tool helps you streamline your efforts, but you can also improve skills by staying curious, reading often and challenging yourself with the most rigorous coursework offered. 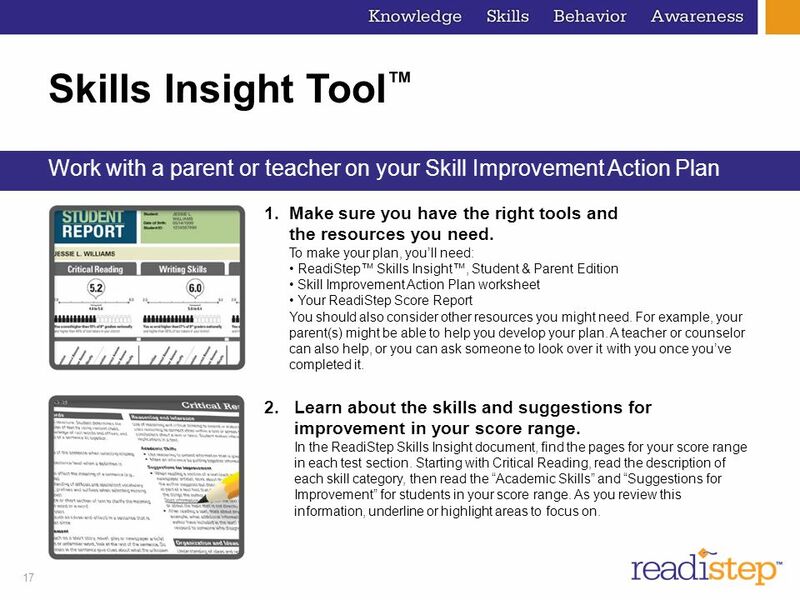 17 Skills Insight Tool™ Work with a parent or teacher on your Skill Improvement Action Plan Make sure you have the right tools and the resources you need. To make your plan, you’ll need: • ReadiStep™ Skills Insight™, Student & Parent Edition • Skill Improvement Action Plan worksheet • Your ReadiStep Score Report You should also consider other resources you might need. For example, your parent(s) might be able to help you develop your plan. A teacher or counselor can also help, or you can ask someone to look over it with you once you’ve completed it. In the ReadiStep Skills Insight document, you will find the pages for your score range in each test section. Starting with Critical Reading, read the description of each skill category, then read the “Academic Skills” and “Suggestions for Improvement” for students in your score range. As you review this information, underline or highlight areas to focus on. Learn about the skills and suggestions for improvement in your score range. 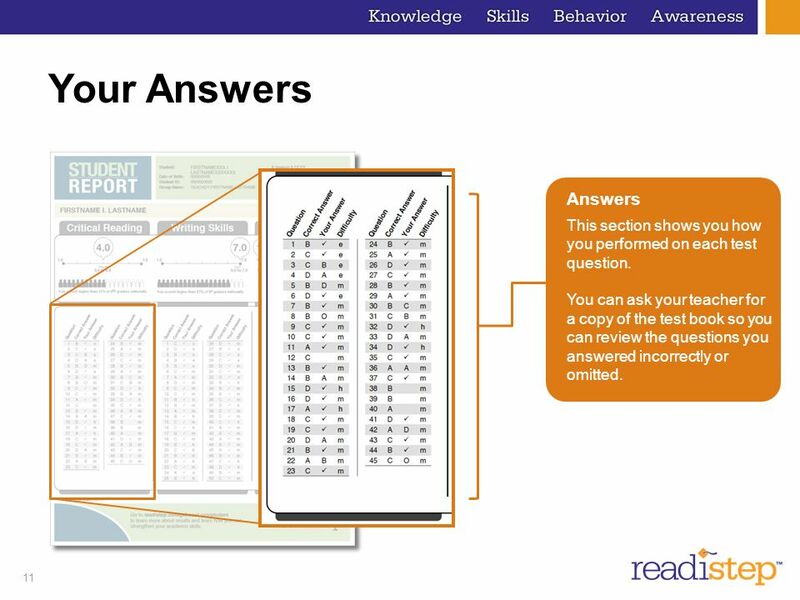 In the ReadiStep Skills Insight document, find the pages for your score range in each test section. Starting with Critical Reading, read the description of each skill category, then read the “Academic Skills” and “Suggestions for Improvement” for students in your score range. As you review this information, underline or highlight areas to focus on. 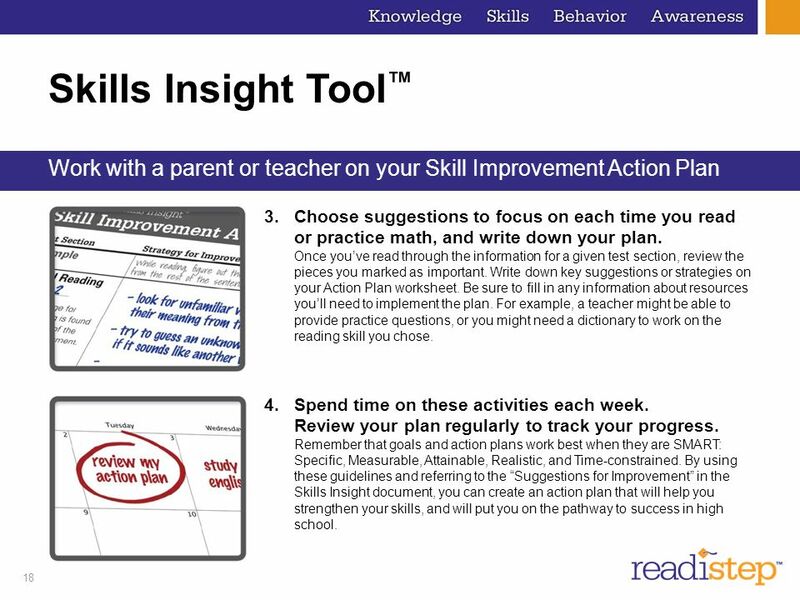 18 Skills Insight Tool™ Work with a parent or teacher on your Skill Improvement Action Plan Choose suggestions to focus on each time you read or practice math, and write down your plan. Once you’ve read through the information for a given test section, review the pieces you marked as important. Write down key suggestions or strategies on your Action Plan worksheet. Be sure to fill in any information about resources you’ll need to implement the plan. For example, a teacher might be able to provide practice questions, or you might need a dictionary to work on the reading skill you chose. Once you’ve read through the information for a given test section, review the pieces you marked as important. Write down key suggestions or strategies on your Action Plan worksheet. Be sure to fill in any information about resources you will need to implement the plan. By using these guidelines and referring to the “Suggestions for Improvement” in the Skills Insight document, you can create an action plan that will help you strengthen your skills, and will put you on the pathway to success in high school. 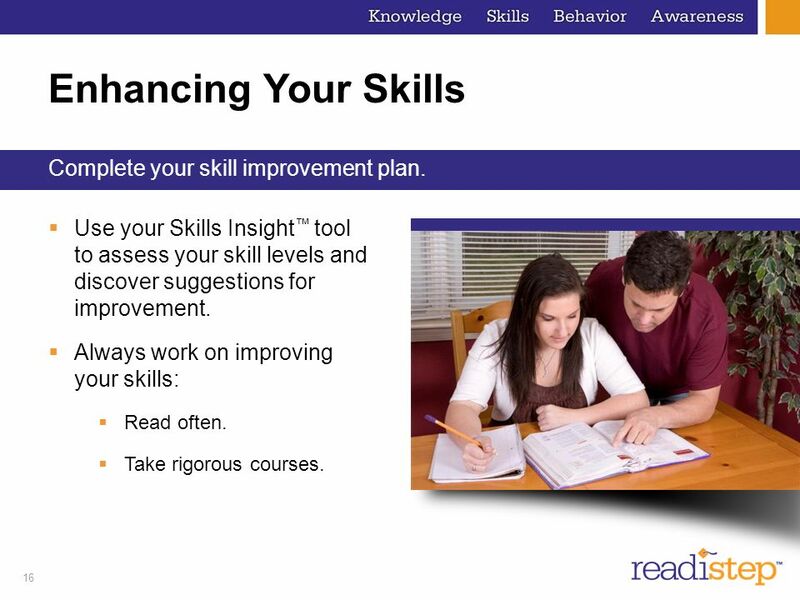 To download a Skill Improvement Action Plan worksheet, go to readistep.collegeboard.org/student. Working with a parent or teacher is recommended on this activity so they can help you improve your skills now and when you get to high school. Spend time on these activities each week. Review your plan regularly to track your progress. Remember that goals and action plans work best when they are SMART: Specific, Measurable, Attainable, Realistic, and Time-constrained. By using these guidelines and referring to the “Suggestions for Improvement” in the Skills Insight document, you can create an action plan that will help you strengthen your skills, and will put you on the pathway to success in high school. 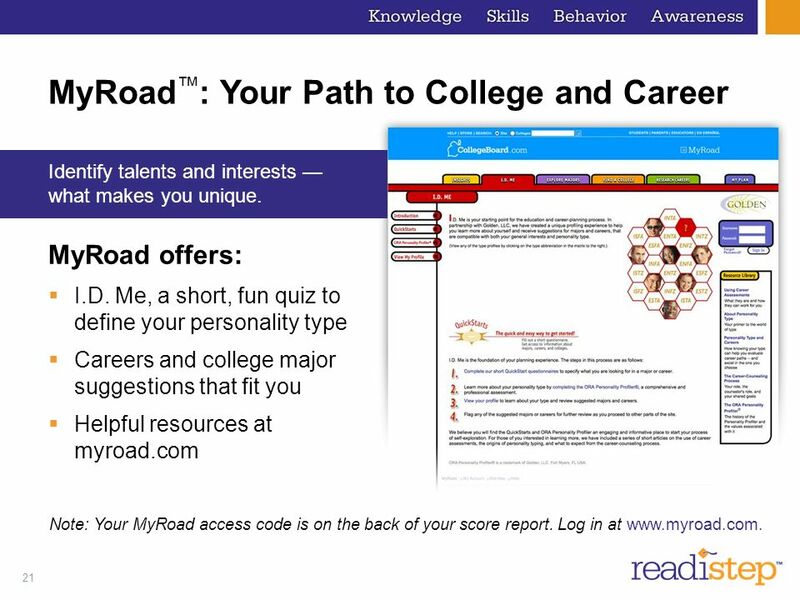 Exploring college and career opportunities with MyRoad. Discover your passion. With the I.D. Me Personality Test. Find college options — by location, major, cost and more. Hear what people have to say about their college and career choices. Create an online portfolio for college and career planning. Track what you need to do in high school to prepare for college. 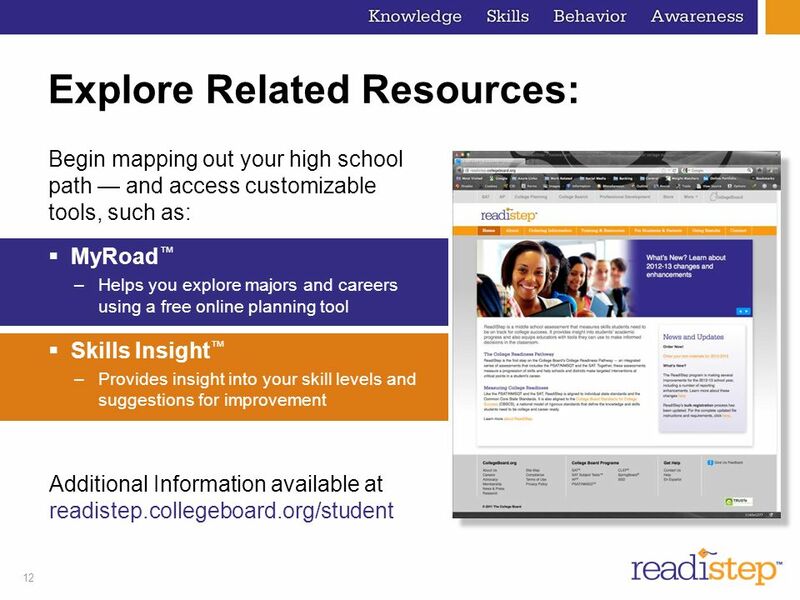 Now that you’ve taken ReadiStep, you have greater insight into the academic skills you’ll need for high school and college. Next, you can take advantage of our fun, engaging college and career planning web site designed just for you. 22 Creating Your Pathway to the Future: Making Your Dreams a Reality! Are you ready to make your dreams a reality? You have already taken the first, important step! ReadiStep™ helps you imagine the possibilities. You can make it happen: Take rigorous courses in high school. Take the PSAT/NMSQT® in 10th and 11th grade. Start exploring college and career opportunities now. For additional information, explore: readistep.collegeboard.org/student Take rigorous courses in high school; take the PSAT in 10th and 11th grade; start exploring college and career opportunities now, and for additional information, explore readistep.collegeboard.org/student. 1. 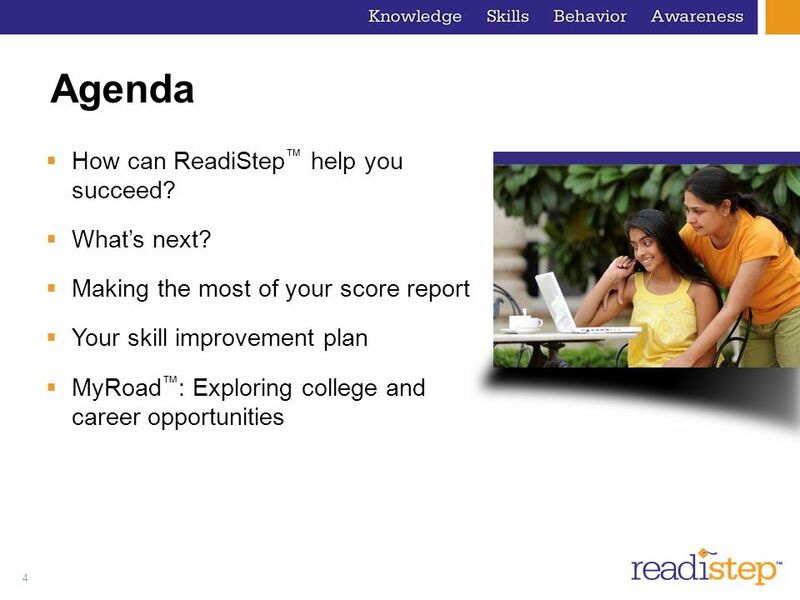 2 Revised ReadiStep Score Scale Agenda ReadiStep and the College and Career Readiness Pathway Revising the ReadiStep Score Scale Benefits. 1 PSAT Results are on the STAGE JUNIOR TEST RESULTS SOPHOMORE TEST RESULTS 1. Understanding PSAT/NMSQT Results The PSAT/NMSQT is cosponsored by the College Board and the National Merit Scholarship Corporation. Video Link. LETS REVIEW……. Where is your On-Line Access Code? Located at the bottom of your score report under the NEXT STEPS. You will have to log in. 1 Understanding Your PSAT/NMSQT ® Results. 2 Agenda Four Major Parts of Your PSAT/NMSQT Results More About Your Skills National Merit Scholarship Information. ReadiStep Results and College Readiness Pike Middle School 2010-2011.